Left Hand Version also available. Tactical Slings attached to the M16/AR15 Carbine at a single mounting point, without the use of the front sling swivel, have become quite popular. These sling attachment systems permit the operator to mount the weapon on either the primary or offside shoulder. As a result, during dynamic entries it becomes easier to "slice the pie" at doorways and move around corners, whether they are on the right or left side, without "telegraphing" the operator's presence. GG&G manufactures the Receiver End Plate Sling Adapter for this purpose. With this innovative accessory the operator can now attach the sling directly behind the receiver, in front of the collapsible buttstock. A significant advantage of this set up is that expanding or collapsing the buttstock does not affect the sling length. If you wear body armor, a tactical vest or a jacket, you no longer need to re-adjust the sling length due to the extra apparel. 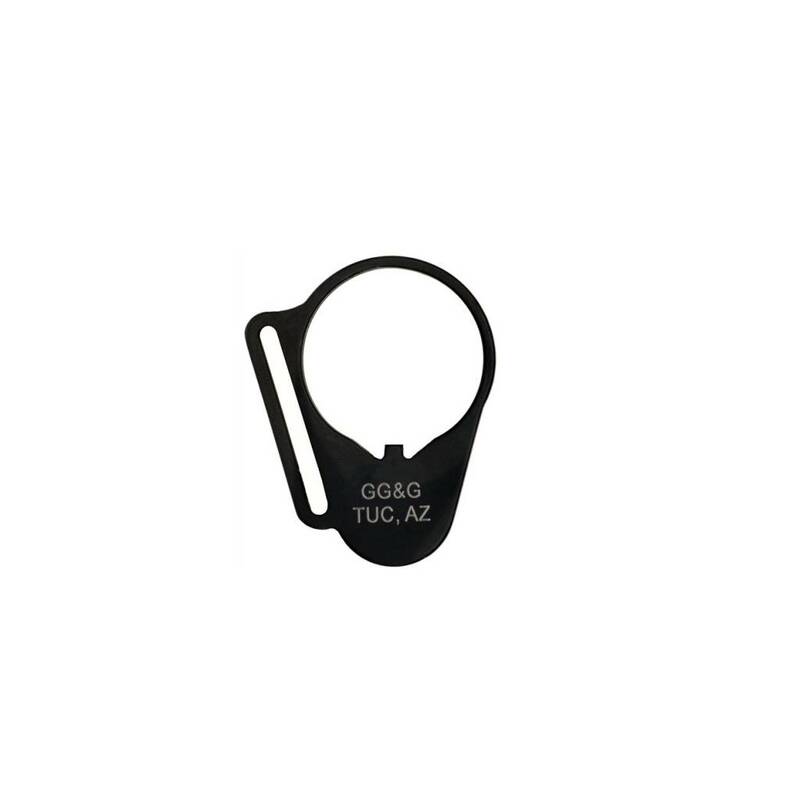 This series of GG&G Receiver End Plate Sling Adapters can also be used to attach a conventional sling in conjunction with the front sling swivel. GG&G offers five Receiver End Plate Sling Adapters for collapsible stocks. These adapters can be easily installed by the operator with the proper tool. All surfaces are de-burred for the operators’ safety. The REP Sling Adapters are available in right hand, left hand or ambidextrous versions. The Big advantage of this set up is that expanding or collapsing the buttstock does not affect the sling length or functionality. This series of Sling Adapters can also be used to attach a two point sling in conjunction with a front sling swivel. The GGG-1072 models have a rectangular sling slot that will accept sling webbing up to 1 1/4" wide. The GGG-1048 & 1049 models feature looped mounting rings for attaching HK style quick clip slings, Chalker Style Tactical Slings or MASH hook combat-carry-type slings. Material: Machined from 4140 ordnance steel. Finish: Manganese phosphated matte black per mil-spec for extreme use.